Photography by Norman Hersom · Drawing by Sydney Hamel, 3rd grader. Frank Lloyd Wright designed homes for people. "A building is not just a place to be. It is a way to be," he said. His iconic design philosophy is embodied in architecture that combines simplicity, harmony, unity and integrity. This incredible home, inspired by Wright’s Prairie Style design, is indeed a wonderful “way to be” for Gavin and Heather Wilkinson, and their two children. Built in 2006, the details of this home were interpreted with exquisite precision and impressive adherence to the Prairie style. 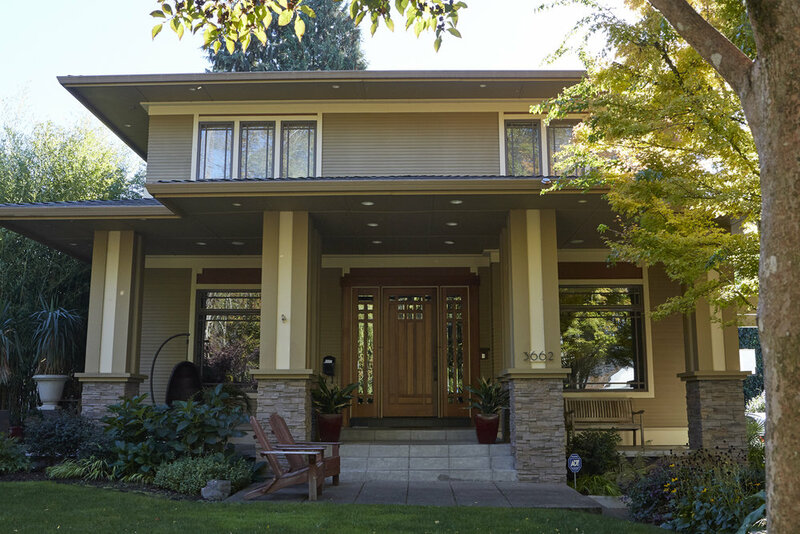 This five-bedroom, three-and-a-half bath home features a low, sheltering roofline with four-foot exterior overhangs and a broad Brazilian cherry front door with raised panels of beveled glass. The 5,128-square-foot home features hardwood built-ins, Brazilian cherry floors with inlaid purple-heart maple accents. These natural surfaces are visually connected to the outdoors by 85 windows (some with custom stained glass). The kitchen features honed-granite countertops, a glass-block backsplash, copper fixtures, and black-stained cherry cabinets. A generous butler’s pantry connects the kitchen to the living room and includes wine storage. The bathrooms are finished in subway tile, with custom fixtures. Detailing throughout the home includes window seats, box-beam ceilings, cherry-pegged baseboard corners, and multi-level lighting in the rooms. A detached three-story garage is reached via a basement tunnel and has a knotty-pine office on its top floor accessed by a spiral staircase, takes home to next-level awesome. The office, otherwise known as Gavin’s man cave, was redesigned shortly after the Wilkinson’s bought the home in 2014. An art piece featuring an original McSwain guitar - crafted and donated to a Duniway Elementary auction by a local luthier and guitar designer (and Duniway Elementary dad), Stephen McSwain - is proudly displayed on the office wall. Another winning auction piece, a bridge and cityscape by Duniway artist and mom Tasha Bartley, graces the wall in the Dining room. A beautiful landscape painting by Christine Joy of Christine Joy Paintings hangs in the living room. The home’s warmth and flowing rooms colored by thoughtful and soft earth tones invite casual gatherings and moments of quiet relaxation. Furnishings in the Arts and Crafts style are found throughout the home, complements to its streamlined, horizontal lines. The kitchen is a favorite hangout spot for the Wilkinson family, as is the basement “kid cave” where Kienan, aged 15, and Brooke, aged 11, like to spend time with friends watching movies, playing Xbox or table tennis. The backyard offers even more fun for everyone, with a deck dining space, waterfall, hot tub, and fire pit. Frank Lloyd Wright also said of his work, "Democracy needed something basically better than the box." Democracy has its needs met one thousand times over in this outside-the-box, brilliant home.